Glamour artists were in demand at the Warwick and Warwick auction held on May 20th. Five general collections of cards, in good condition, were on offer, containing cards by artists such as Bompard, Corbella, Colombo, Mauzan, Meunier and Nanni. In total the pre-sale estimates came to £1,650 and the total hammer price was £2,810, making the total realisation £3,315, including the buyers’ premium. A range of 21 cards by Raphael Kirchner, in good condition, estimated at £390, realised £554 and his Portraits of Viennese Ladies set of 6 made £130. 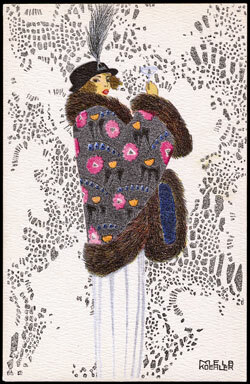 Six art deco glamour by Mela Koehler made £94. 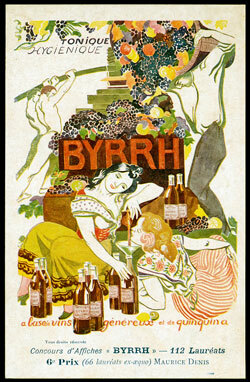 The company manufacturing the French wine-based drink Byrrh ran a poster design competition in 1903 and many of the designs were reproduced as postcards. A collection of 24 different designs was offered as a single lot with an estimate of £700. The realisation was £737. Collections of comic cards were well received by the room bidders, as long as the condition was good. 3 collections with estimates totalling £710 realised £2,354. In less demand were topo art by A.R. Quinton (400 made £260) and Bonzo by G.E. Studdy (26 made £40). 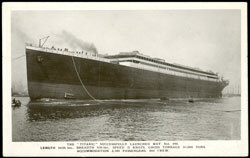 McGill collections also under-performed, but poor condition was a factor. Railways, military and foreign royalty collections were all strong performers. 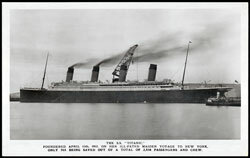 The shipping section included a Belfast launch of the Titanic, by Walton (£318) and the same ship against the quayside at Belfast, by Hurst (£248). 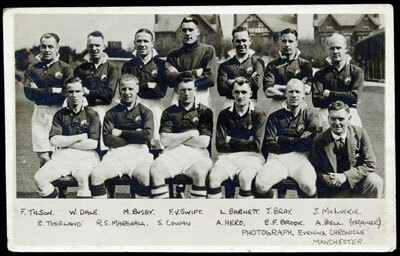 An RP card of the Manchester City team included Matt Busby and goalkeeper Frank Swift, who was killed in the Munich air disaster, when he was a sports reporter. Estimated at £50, the card realised £76. The Denbighshire towns of Colwyn Bay and Rhos on Sea were star performers in the topographical section of the sale: a collection of 700 was estimated at £1,100 and made £1,888 and a collection of 900, estimated £420, made £708. Manchester and suburbs was in great demand, as was London and suburbs. The best performer in the foreign topo section was a collection of 150 Singapore, estimated at £270, which realised £767. The next Warwick and Warwick postcard sale is on July 15. To view the full catalogue when it becomes available online click here. If you have a collection of postcards to sell then contact Colin Such, or visit our postcard department page for more information.